Look at a simple example of how plan vs. actual analysis works. Where do these numbers come from, and what do they mean? And, further on, how do you use them to manage better? Here’s some simple vocabulary: In accounting and financial analysis, the difference between plan and actual is called variance. It’s a good word to know. Furthermore, you can have positive (good) or negative (bad) variance. If you sell more than planned, that’s good. If profits are higher than planned, that’s good too. So for sales and profits, variance is actual results less planned results (subtract plan from actual). For costs and expenses, spending less than planned is good, so positive variance means the actual amount is less than the planned amount. To calculate, subtract actual costs (or expenses) from planned costs. The opposite. When sales or profits are less than planned, that’s bad. You calculate variance on sales and profits by subtracting plan from actual. When costs or expenses are more than planned, that’s also bad. Once again, you subtract actual results from the planned results. I’d like to show you this with a simple example. Let’s start with a beginning sales plan, then look at variance, and explore what it means. 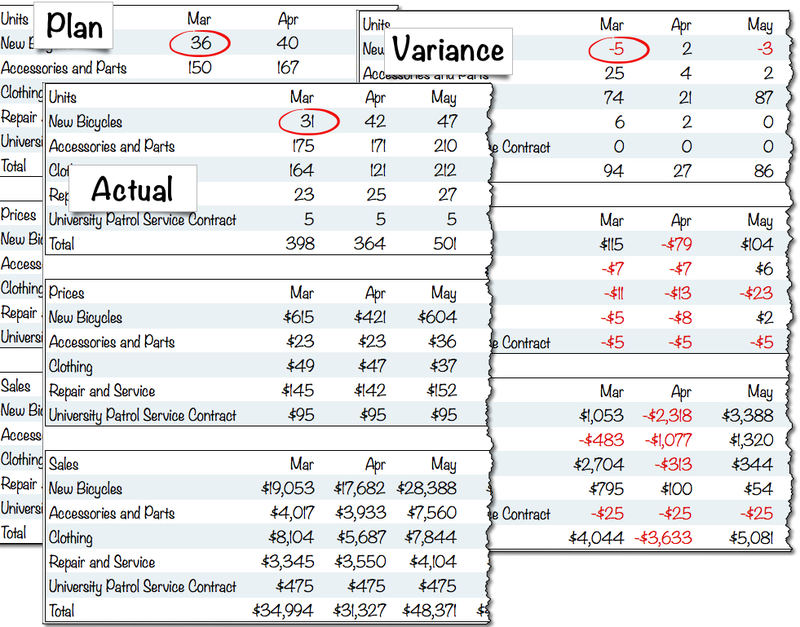 In the illustration here you see sales, actual, and variance for bicycle unit sales for the month of March. You can see in this illustration that the plan was for 36, actual sales were 31, so the variance was -5. The plan for April was 40 units, actual sales were 42, so that’s a positive variance of 2. Regarding units, in March the store sold five fewer bicycles than planned; and in April, it sold two more than planned. That’s a negative variance for March and positive for April. But wait – there’s more. I use prices in this example to point out that plan vs. actual analysis offers a lot of good information. Look at the prices of bicycles for March, April, and May. You can see there was a price promotion going on in April, right? The price of bicycles went down. It was supposed to be $500 on average, but it ended up as $79 less than that. And the increased units over plan were not enough to compensate for the lower average price per unit. The value of April sales of bicycles ended up $2,318 less than planned. The store’s total sales for the month suffered, and ended up $3,633 less than planned. This simple example shows why regular review and managing plan vs. actual results is steering the company, and management. The variance analysis in this case leads to insight about price promotions. It might generate discussions about what went wrong. It might change some future decisions about price promotions. And of course it needs to generate some spending adjustments to compensate for the less-than-expected sales. The team has to work together, not looking to assign blame, but rather to gain insight and to adjust the business. In this case, you can see that the actual marketing expenses were $326 less than planned, which is a positive variance, because an expense less than planned is a positive variance by definition. But is this good? Here again, I want to show you the management implications of plan vs. actual. With the sales plan vs. actual we saw a sales promotion based on price. Apparently it failed, because the price attracted too few buyers to compensate the store for the discount. But was the price the problem, or did somebody fail to execute on marketing? Is spending less than planned, during a promotion, a good thing? The prices came down but maybe the marketing department failed to tell people about it. Where is the management problem? What needs to be corrected? These are examples of good questions coming from plan vs. actual analysis. Furthermore, let’s revisit the results with a look at what happened in May. In that month, the marketing expense was higher than planned, by $326. That’s a negative variance, an expense higher than planned. But another thing that happened in May – you can see it in the sales variance – was a price boost back to above plan, and sales revenue well above plan. So maybe that negative variance was actually good marketing, well executed. So if you and I are running the bicycle store, we need more information. We need to look at results and talk about them with the team, to take advantage of what’s working, and correct what isn’t. And the variance analysis – plan vs. actual – provides the clues. Then it requires management to follow up and take action. What’s important is not the accounting, the calculations, but rather the resulting management. Garrett, the bike storeowner, watches the variance every month. He looks for indications of problems, or unexpected positives, so he can react. In this picture, the variance is negligible. The forecast was remarkably close to actual results. Still, Garrett should investigate why he’s selling fewer accessories and parts than planned, and whether the up and down of repair and service is worth reviewing. The point is the management. 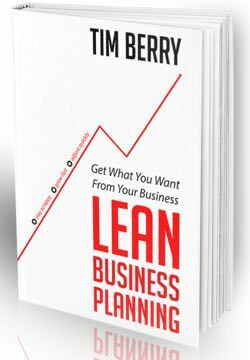 Lean business planning is about the management, not the hard numbers. What should be done, given the variance, to make the company better?